Before coming out with our Holiday Home Tour post tomorrow I thought it would be fun to highlight some of the DIY Christmas crafts I've done in years past (and always meant to share on the blog but never did). Each year I seem to add some sort of DIY Christmas craft to our assortment. I typically don't set out to find the perfect DIY craft but there always seems to be something specific I want to add to the decor and can't find in stores. So I set off to make it! Here are the crafts, a bit about why we made them, and a brief "how" for making them! If you'd like to make one and don't feel like there's adequate information please let me know. I did my best to give a general sum of the project where you can make it yourself but didn't outline every single detail. All of them are definitely on the beginner scale of crafting but they can be time consuming (and require patience). Why? We needed some ornaments for our tree. 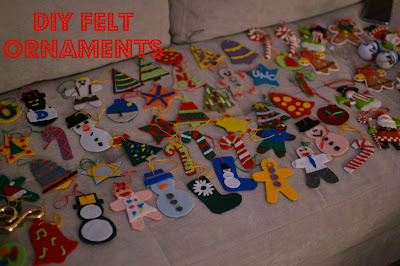 These DIY felt ornaments were our first DIY Christmas craft. In 2010 we were just out of college (and recently dating) and needed to deck out our tree on the inexpensive side. 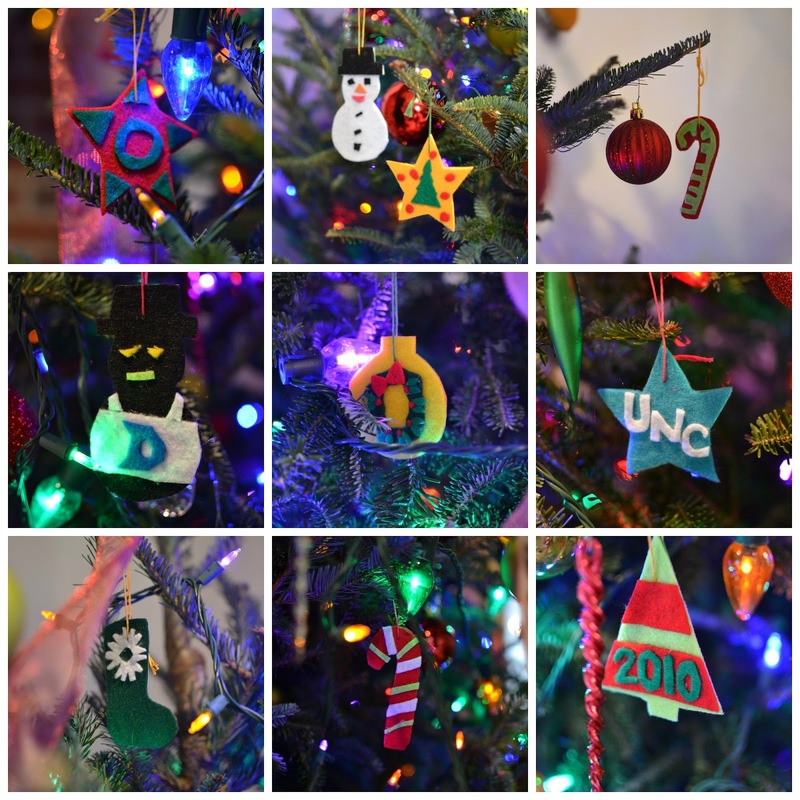 What was a crafting date night to produce colorful, personalized cheap ornaments turned into a wonderful holiday memory that we cherish and reminisce on each year when we pull out these ornaments. 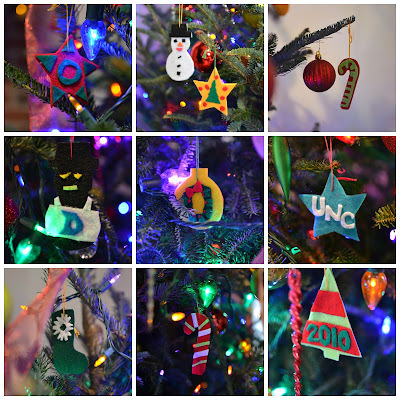 The felt ornaments are also unique and really make our tree stand out. How? I decided that felt ornaments would be the most effective way to produce enough ornaments to decorate a whole tree. I found a template online for holiday shapes that would make good ornaments (here are the ones I used). The template was traced onto both cardstock paper and the felt. The felt shape was then glued onto the cardstock which provided the felt with a sturdy base. We then decorated the felt shapes however we wanted - our creativity and personality (and skill) really shine here! To decorate the shapes we would make cut outs in other colors of felt and glue it onto the felt base. To finish the ornament we used threaded an embroidery thread loop for hanging. Materials: Cardstock, felt, tacky glue, embroidery thread. Scissors, needle. Why? I don't have a distinct memory of why I wanted these trees. I think I thought they would just be a fun project and they were! I love the way they turned out and have such fun putting them out each year. They seem to find their way into a different place each season. Out of all the craft projects I'm sharing in this post these are the easiest. I also used leftover felt from the ornaments (I bought lots of felt for that project). How? Begin by hot gluing the end of the green yarn to the base of the styrofoam cone. Wrap the yarn around the cone and keeping each wrap of yarn as close to the one before it as you can. Place a dot of hot glue intermittently to secure the yarn to the cone. Continuing wrapping the yarn until it is coiled on the top and finish with hot glue. After the yarn has been wrapped around the cone, cut a base for the tree from brown felt that is slightly larger than the base diameter of the cone. Hot glue the felt to the cone. Next is adding the ornaments. I chose burgundy and white dots of varying sizes. Glue the ornaments to the yarn tree. Finally cut two diamonds for the star; lay one diamond on the table, place hot glue for the toothpick and glue the toothpick, add a bit more hot glue and add the other diamond onto the first. Now stick the toothpick into the top of the cone and you have a star on your tree! Repeat until desired amount of trees in your felt tree forest has been crafted! 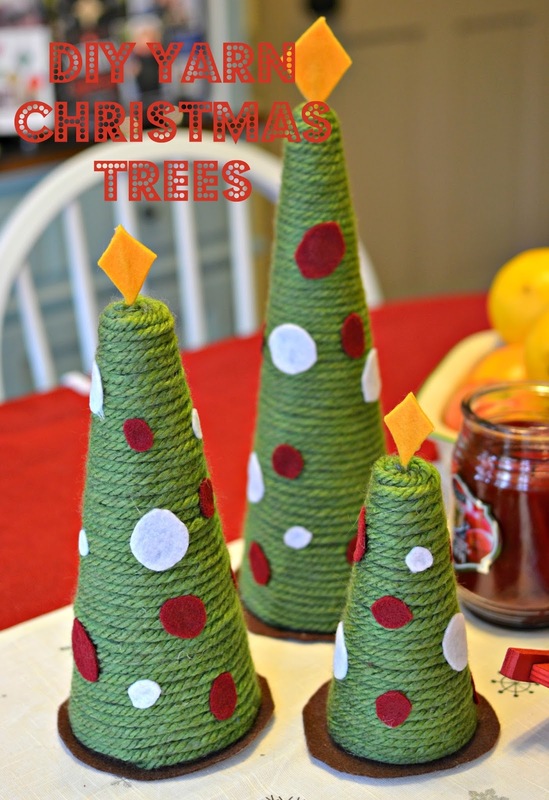 Materials: Styrofoam cones (various sizes), green yarn, felt (for ornaments, star, base), toothpick, hot glue sticks. Scissors, hot glue gun. Why? Well we decked our tree in ornaments and then we needed a tree skirt! It seemed fitting to make a tree skirt to coordinate with our ornaments. Off I set to figure out how! This project has the potential to be really "easy" but I chose to hand sew each individual sequin on so it was quite time consuming. 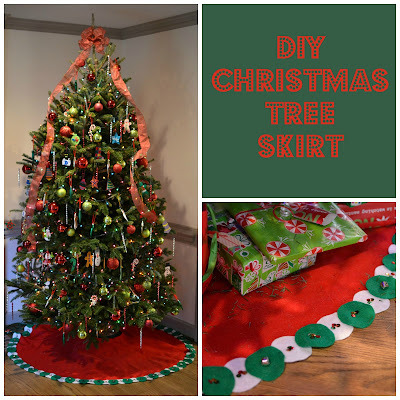 Anyone can cut a yard of felt into a circle - the difficulty will lie in how you choose to adorn the tree skirt. I'm really opposed to tree skirts with large images on them because eventually the presents will cover them up. Therefore I planned some pops of traditional Christmas color for my skirt. How? I followed this tutorial for preparing the skirt. 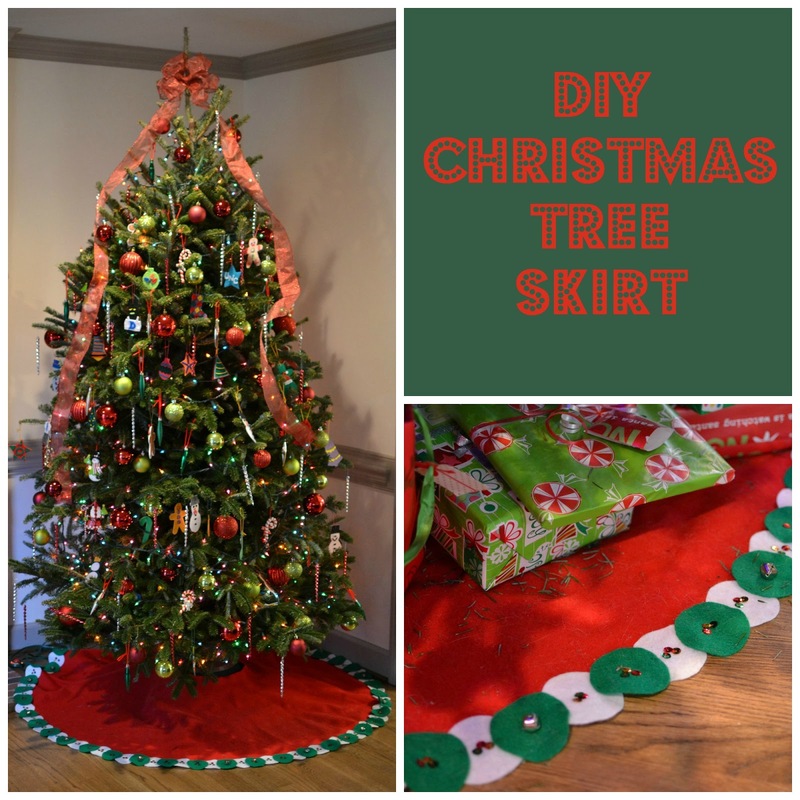 It gives a standard measurement for how big the tree skirt should be and easy instructions for executing an even circle. Then you cut down the radius and cut a smaller circle for the base of the tree. I then cut an abundant number of 2" round green and white felt pieces. I alternated these around the base. I would place the green and white circles around the base (probably worked with about five at a time) and pin them down. Then I used needle and thread to sew the sequins onto the circles and the base. With one piece of thread I would sew the sequins and the edge of the circle down. This was in case a piece of thread ever breaks the tree skirt will not lose all of the sequins and border. Every now and then instead of sequins I would sew on a jingle bell. I'd be happy to share more details for the method to my madness but I doubt I'm going to inspire too many folks to DIY a tree skirt in this manner. Finally I added closure snaps to skirt in the back. Materials: Felt, sequins, small jingle bells, thread, closure snaps. Scissors, needle. Why? We needed new seasonal decor for our mantle. We've learned over the past year that if anything goes on the mantle it needs to be unbreakable or not sentimental if it gets knocked off (because - cats). Last year's mantle decor didn't pass our new requirements. I started by stringing some lights onto a previous green garland we had. As I was out and about I began looking for decor pieces that had height and found two reindeer to flank both sides of the mantle. Then I decided canvas reindeer art would be the perfect finishing touch to the mantle. Well after much searching on Etsy and in craft shops I came to the conclusion that I was the only person with this vision. 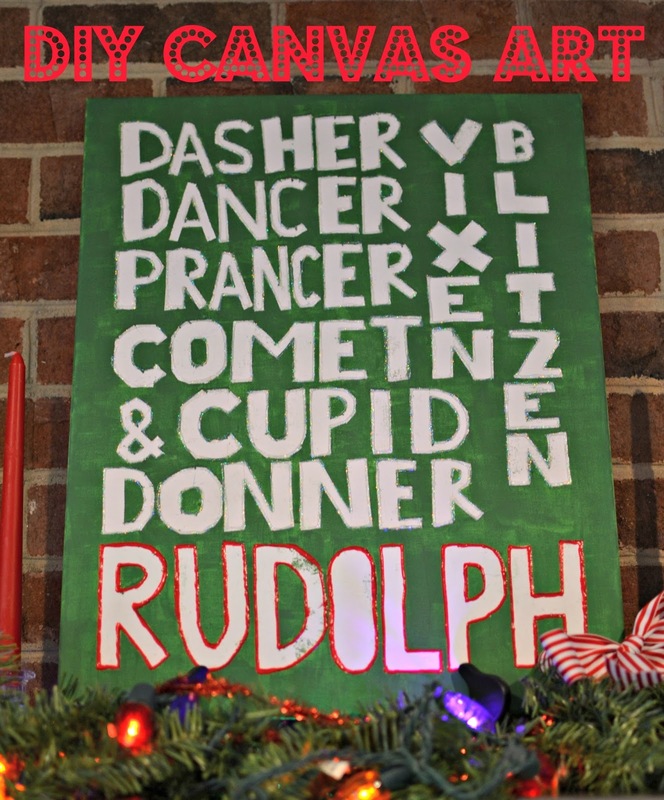 So off I set to execute this canvas reindeer name art. How? To begin you'll need to do some planning and math. I sketched out the orientation of how I wanted the reindeer names in Paint and moved the letters around until I liked them. Next up is the math. Measure your canvas and decide how tall your rows will need to be to fill the space. I think my canvas was about 18" tall and I planned a 1" border, 6 - 2" rows, and 1 - 3" row (for Rudolph) with 1/4" between the rows. Then the width of the letters was set according to how much space needed to be taken up. All very precise... not really; I freehanded everything but you could be more precise! I would use a ruler and pencil to make general guidelines though. I fashioned the letters from crafting tape and lots of cutting. This is time consuming. After the letters were all taped I painted over the entire pieces with green acrylic paint. Once it dried I peeled off the tape and was left with white letters and reindeer names! 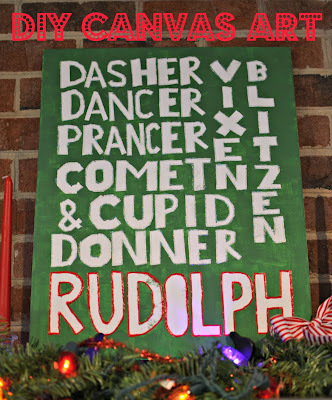 Finally I outlined the letters in fabric paint - clear glitter for the reindeer names and red for Rudolph. Some green paint leaked under the tape and if I feel up for it I may use some white paint as touch up but it's only noticeable up close. I tell myself it gives it character! Materials: Canvas, tape, acrylic paint, fabric paint. Ruler, pencil, scissors, foam brush. Tune in tomorrow for our holiday home tour. I love the felt ornaments you made for us. They are on the tree. All your crafts are pretty but I especially like the tree skirt.